There are many online continuing education options out there for OTs, SLPs, RNs, ATCs, and PTs. They have different price points and different course offerings, and some are subscription-based, while others are pay-per-course. One of the most popular choices is MedBridge Education, a quickly growing Seattle-based organization with videos, webinars, and patient resources galore. 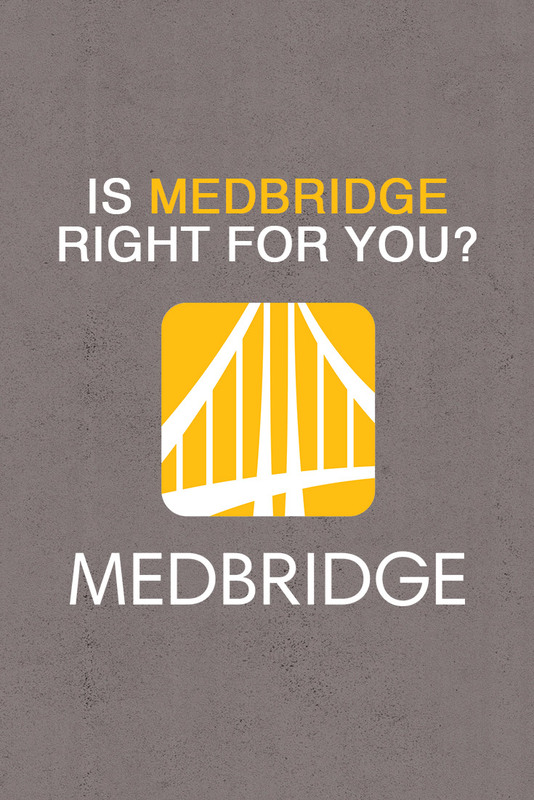 “Is MedBridge worth the cost?”. MedBridge has been my CEU provider of choice for three years now. It has absolutely been the right fit for me. In this article, I review the MedBridge Platform to help you discern whether this option is the right choice for you. Essentially, the Education Plan is best for people who want to learn and get CEUs from their MedBridge subscription. With any MedBridge subscription plan*, you get continuing education. A MedBridge subscription plan* provides all of the continuing education you will need for state and national licensing**, and will automatically submit any of the CEUs you complete with your subscription to the appropriate board (provided your license information is up-to-date in your profile). With the education plan, you also get access to MedBridge's reference tools (which are described later in this article), as well as access to a practitioner-facing app that let's you access the CEU and educational materials. The Premium Plan gives you all of that, plus resources for patient engagement (including a home exercise builder, patient education materials, and access to a proprietary patient-facing mobile app). That’s really the main difference: the patient-facing resources. These are described more in depth later in this article. The majority of MedBridge subscribers do wind up opting for the Premium Plan so they can access these resources. Already know you want to subscribe? This discount code never expires, and it provides the biggest savings possible. With the discount code, OTs, OTAs, PTs, PTAs, RNs, and ATs will pay just $200 per year for an Education Plan or $250 per year for a Premium Plan. SLPs pay $95 per year for the Education Plan or $145 per year for the Premium Plan. *If you are a student or a professor who is interested in having MedBridge for your classroom, please check out my page about the MedBridge Student Membership. Want a bit more info before you commit? Read on for pros and cons of the MedBridge offerings, including the optional patient-facing resources only available in the Premium Plan. Let’s get into what makes MedBridge great, along with some areas where it can stand to improve a bit. Then, you can make the decision whether it’s right for you. I am a continuing education nerd. I’m thrilled about the new technology that allows me to sit on my couch while I learn from the best (in pretty much every practice niche there is). MedBridge is among the frontrunners in video quality, and the platform boasts a solid pool of professionals—I recognized names like Jan Davis, Rick Gawenda, Adriaan Louw, and Teepa Snow, just to name a few. **If my state requires "live" hours for license renewal, will the webinars fulfill this? In addition to traditional online CEUs, MedBridge has pivoted to help fulfill the live hour requirements, and now provides one to two live webinars each month. You can see the live webinar calendar here. The live webinars provide a platform for questions and interactions to help meet most state licensing requirements. Each state’s requirements vary, so I recommend looking at your individual state requirements or contacting MedBridge for specific questions. Pros: If you work in any of the more common OT settings, you’ll find a breadth of excellent continuing education options. I would say the strongest offerings are in adult outpatient, home health, SNF, hand therapy, women’s health, and acute care. Here is the complete list of categories. Another perk is that you get to watch an actual person present and see patient demonstrations! Unlike many other online continuing education programs, the videos use live models, rather than relying on recorded PowerPoint presentations. When I first wrote this review of MedBridge in 2016, my main critique was the lack of pediatric options. However, the company has really expanded its pediatric offerings over the past two years. MedBridge now boasts more than 250 courses for pediatric practitioners, and is continuing to expand. That being said, I still recommend you search their courses to make sure they have content that you are interested in, before you bite the bullet and subscribe! One of my favorite things about MedBridge is that they’re extremely receptive; if there are topic areas you’d like covered, they welcome your suggestions. The reference tools section has short videos (anywhere from one to two minutes) of orthopedic tests and manual therapy techniques. Pros: The library is extensive. The techniques are broken down into body regions. For example, in the hand/wrist orthopedic tests category, there are about 60 videos (ranging from Boyes test to Mishra Test II). This is more than I learned in OT school. After spending some time with the videos, I could not come up with many critiques other than that I want more of them! I would love to see some categories beyond orthopedics and manual therapy… perhaps neurological tests would be the next logical category? I also searched for mental health videos, and there is much more available than the last time I released this article. In addition to quite a few courses on dementia, there are a few non-CEU-approved courses about dysphagia and cognitive impairment, as well as a few sports psychology-type courses. That said, I still consider this an area for improvement, as I couldn’t find enough courses that truly do justice for the niche of mental health OT. I love having access to a mobile app. If I’m unexpectedly stuck at an airport during holiday travel, it’s incredibly convenient to whip out my phone and start working toward my license renewal requirements. I happen to love MedBridge because of its patient care resources, and think they’re a big part of what makes MedBridge such a robust choice for clinicians. For each patient, you can create a unique patient care program with exercises, condition-specific resources, and other patient education videos/handouts. Your patient then gets a unique access code via text or email, which invites them to a patient portal that they can access from home. You also have the option to simply print off your handouts, as seen above. In 2017, MedBridge also released the MedBridge GO app, which walks patients through their exercise program using short videos. Here is an overview of how you can leverage the MedBridge GO app and best practices for home exercise programs. Pros: The process is quick and easy! I created the above patient handout in about two minutes. The handouts and videos feel modern and are well-designed. They are decades beyond some of the handouts I have dug out of the back of filing cabinets. In the patient education library, there are 85 orthopedic and neurological conditions with either a video or a handout. There is also an option to upload your own exercises and videos. If I were a patient, receiving quality, customized exercises and education through an online portal would feel above and beyond my expectation for excellent care. As with every patient care library, not every exercise and piece of education you want will be there. There is an option to request new items (see below for the process). When I first reviewed this portion in 2016, one of my biggest critiques was that it seemed like every image had a model who was white and 25 years old. After scrolling through the options again, I can see that MedBridge has begun to use a more diversified pool of models. I would like to see this keep expanding to reflect the diversity of patients we serve! After spending time with my MedBridge account and talking to fellow users, I still had a couple of questions, and I was able to connect with a representative to get the following answers. How would you define the ideal MedBridge user? Anyone who wants to improve his or her clinical practice. MedBridge is a great solution for clinicians from all backgrounds, levels of experience, and levels of technical expertise. It is a tool not only to gain CEUs, but also a resource to continually improve your practice, from learning the latest research to learning new intervention strategies from industry thought-leaders. MedBridge also has a great solution for organizations. Over 650 clinics, hospitals, and other institutions subscribe their full staff to MedBridge as a tool to develop their clinical practice and patient care, helping their clients get better. In what format are your courses delivered? We have three types of courses: compliance courses, live webinars, and continuing education (CE) courses. Our CE courses are all video-based, and our compliance courses are in an interactive online e-learning format. We do have PowerPoint slides that accompany each course, which are available for download. We also have a mobile app so that you can watch/listen from your phone while you're on the go. How many courses does the site offer, and how frequently do you add courses? There are more than 1000 accredited courses available for clinicians, 550+ of which are specifically accredited for OT use. We release new courses each week, and are currently launching about 30-60 new courses each month. What are some of the newest courses you’ve recently added? As an AOTA-approved Continuing Education Provider, all of our courses count towards your NBCOT renewal. The only exception is our compliance courses, which are not accredited for CEUs across disciplines. While they don’t provide CEUs, these courses are fantastic for OTs pursuing non-traditional roles in management and compliance. Another great perk we offer is that, for every one contact hour completed from MedBridge’s AOTA approved courses, you earn 1.25 Professional Development hours through the NBCOT. If you are looking to renew your NBCOT this year, MedBridge is a great solution! How often do you update the stock exercises/patient education? What is the breakdown of the types of exercise videos you provide? What is the process and timeline for responding to a request for new exercises/education? Our Patient Engagement team is very responsive! The exercise requests are quickly responded to, with directions on where to find the content, if it exists, or a request for more information. You can request new specialties (such as aquatics, SCI, stroke) or specific exercises within specialties we already offer. We have some exciting new solutions in store, specifically for OTs, to be launched over the upcoming months! Do you know of organizations that are buying MedBridge subscriptions for their entire staff? Seems like a great way to keep everyone on the same page. Yes, just over half of of our subscribers are signed up by their organization through our Enterprise Solution. We work with organizations in all healthcare settings, including hospitals, outpatient, home health, and SNFs. Our customers range in size from five to several thousand staff members, and they purchase MedBridge to maintain consistency across the organization, not only for high-quality clinical education, but also for patient education and home exercise programs. The true value to these organizations comes from MedBridge's administrative tools, which include a fully robust Learning Management System, allowing managers to upload their own content, use MedBridge content, create quizzes, and more. Organizations are able to create tracks of learning, such as new employee orientation, compliance, competencies, and specializations. In addition, our robust Outcomes-Driven Reporting tool allows for transparency into your organization to identify areas of weakness, and provide targeted clinical and patient education to improve outcomes. Any site updates in the works that users will benefit from in the next year? There are a lot—far too many to mention here! We continually engage our users to identify the best ways to improve the product. As mentioned above, there is a great deal of new content added on a regular basis to ensure there are always new learning opportunities to help you provide the best quality of care to your patients. The more you put into this platform, the more you will get out of it. The site is extremely interactive and ripe for continued growth. Therapists who work in outpatient, SNF, acute care, home health, school districts, and private practices will find this a natural fit. I hope other therapists will also consider a subscription, and advocate for the courses, exercises, patient education, and reference tools to fit their practices! If this is the right education option for you, you can subscribe for $200 (or $250 if you want all the features of the Premium Plan) by using my promo code "OTPotential" when you check out. You can also use this affiliate link for the same discount! If you have any questions about getting started with MedBridge, you can also check out my post on tips for using the service. Do you have any advice for potential MedBridge users? Share your experience below, and I might incorporate it into the post when I do an update! Please note that I am an affiliate of MedBridge, and thus have an incentive to connect the right users with this service. However, this post was not sponsored or suggested by MedBridge. Descriptions and opinions are my own.